Sanada Town (真田町) is the birth place of Sanada clan located. Sanada Yukitaka( 真田幸隆), who is the grandfather of Sanada Yukimura (真田幸村), offered his service to Takeda Shingen and becomes one of the 24 Shingen's Samurai. That was the beginning of the legend of Sanada clan. There are many ruins, such as castle, houses and spots where Sanada Ninja trained. most of the spots has parking. Sanada Yukitaka and his son Masayuki worked for Takeda clan. However, after the fall of Takeda, Sanada became one of Daimyo, feudal loads under Toyotomi government. Sanada Nobuyuki, brother of Masayuki and older brother of Yukimura, took a side of Tokugawa Ieyasu and against Toyotomi Hideyori. After the battle of Sekigahara, Sanada Nobuyuki became the lord of Matsushiro. ... was built in early 16th century by Sanada clan. It was former castle of Sanada before Ueda castle. It is typical mountain castle with U-shape surrounded by cliffs. The samurai houses were located on the open side. At the top, you can see great view of Sanada Town. ... is where Sarutobi Sasuke (猿飛佐助) trained his jumping skill. It is chosen as one of 100 best forest in Japan. 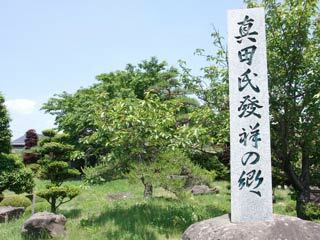 ... is where Kirigakure Saizo(霧隠才蔵) was trained his hiding technique. There are two waterfalls which have 5m high.